I met a blogger, who knows a blogger who I know! Dang it. I didn't want to blurt it out like that. But if you don't like wordy posts, then you can stop here, maybe glance at the pictures. Do leave a comment please. Thank you. Have a nice day! So, I have been very inspired and delighted by the tiny paper houses made for Christmas villages. Many of them are vintage, and have a sweet handcrafted charm, and there are new ones, and many creative people share templates and tips for making them. I saw some very sweet ones the other day, and I thought: It would be more meaningful and personal to make some myself. I mean really, how hard could it be? Cardboard. Glue. Glitter. A little measuring. A little cutting. Stuff. I Googled "Paper Christmas Houses" and showed Alex the best examples of what I wanted to make. The best examples were at 32˚North, a treasure trove web store. That's their charming cottage, with paned windows and the Gothic arched door. "You need good details, like those gold trims, and the tiny trees," Alex suggested. We clicked and clicked and clicked through the amazing inventory of dresdens, and millenery, gazing at the barn and church, the lighthouse, and little houses. Many of the supplies are from Germany, England... faraway places. I worried that placing an order would be slow. I was getting anxious to make my putz house right away! Then to my amusement and delight, I discover that the online store is based here! in So Cal. After thinking on such a global scale, it now felt like we are practically neighbors! My amusement and delight compound. I admire my gumption. Just saying. 'Cause you know, it's not like there aren't forty-two other things I should be doing, it's not like I don't have other hobbies (embroidery, quilting, crochet, chicken farming etc...) Not to mention housework. Seriously: Do not mention "housework." Blithely unaware of the skills I lack, contentedly ignoring laundry and vet appointments, I jumped right in to putz construction 101. With every cut and measurement, with every projection of what is really involved... my tiny village vision got smaller and smaller and smaller. It's not just the planning, and the patience it takes to configure all the parts, it's the time. It must take lots and lots of uninterrupted time. Uninterrupted Time = Priceless Commodity. I already had Maria by my side eager to get her hands on the utility knife... she had a village vision too! Actually, with some mica, a little glitter, and pretty paper trim, I think her house would be lovely. I left my bit of cardboard putz progress on the dining table, and went back to study the possibilities at 32˚ North, to reignite my so-called gumption. I had so many questions, so much curiosity... all of it began to erode my shyer nature. Still impressed with their close proximity, I picked up the phone and made the call. I am so glad that I did. Amanda was patient answering my questions, sharing my amusement about our close proximity. She remained calm, in spite of my st@lker-like enthusiasm. After my shyness wears off, I can display tendencies of "aggressive friendliness," or so I have been told. She mentioned her blog as a possible resource for tutorials, and of course I immediately dialed in the URL, and then my amusement and delight were doubly compounded... she was linked to familiar bloggers, to favorite sites, to my dear friend the "Pink Purl" herself, Tracy! (Naturally Tracy would be the one to teach me about World Kindness Day.) It turns out that Amanda and Tracy are friends too. Geoff took one look at the little putz houses, and he knew. "You should just buy one!" He understands the time and skill that go in to making things, especially beautiful things. Well. Even though he is absolutely correct, I couldn't help ordering a few trims and dresdens from Amanda's Etsy Shop. All of those beautiful treasures were irresistible. 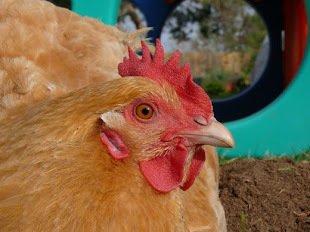 And maybe, with help from her tutorials, and the hope of finding twelve hours of uninterrupted time, I might make something to get my little village going... maybe a chicken coop! And if you think you might like to get crafty, Amanda also sells project kits. I think I should have started with a kit. 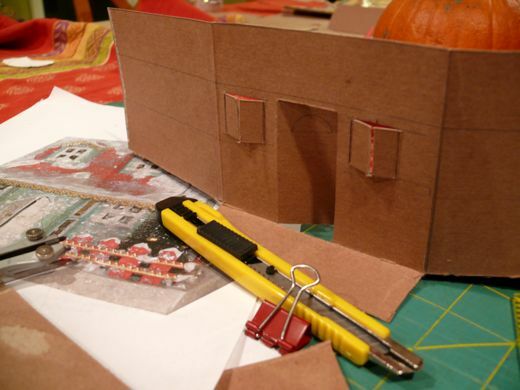 I just can't seem to let go of the fantasy of making an entire village of paper houses! My delusions are so amusing to me. And also, I am impressed that I could resist inserting "It's a small world after all" somewhere in this post. Oops. Until now. Amanda... oh, your praise is priceless, but I wonder if I will ever get any further with mine than the shutters. The more I look at your houses, and consider what it will take to complete mine... let's just say, I am not too hopeful. But I am happy thinking of it, and admiring yours. Your blog is special, and your work is too. It is my pleasure sharing this happy discovery with everyone. I love those little houses. 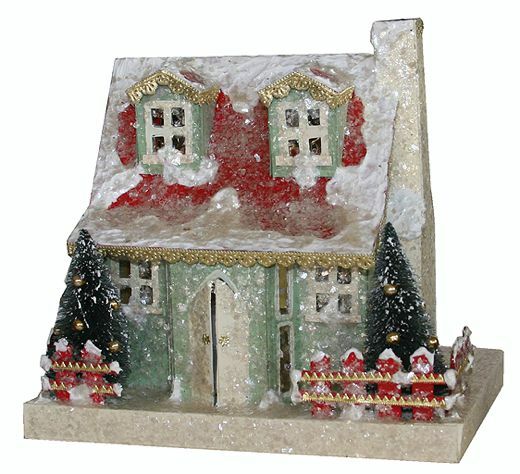 Through my childhood, we had one little white glitter cottage that nestled in the branches of our Christmas tree. My sister and I used to vie for the honor of placing that little house on the tree. They are so charming. I can well imagine the ache to be the one who got to place that ornament in the tree. Gee, maybe I could scale back my ambition and make an ornament size house? Oh I just love those little houses and have a whole village of vintage ones we use every year. Last year I made a few of my own and like Alex said it's all of those ity bitty details that make them so charming. 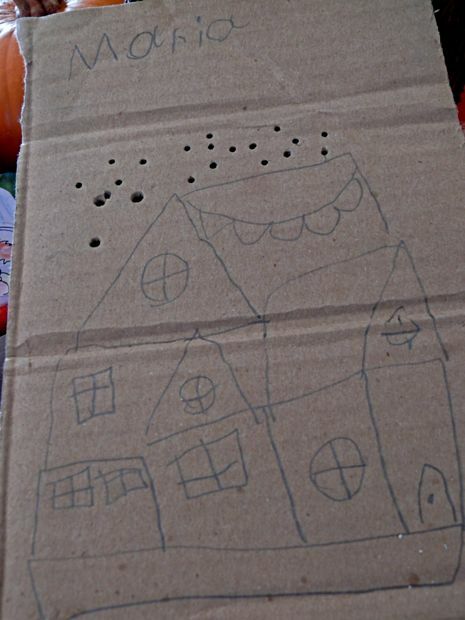 Here's a tip to share- I used my scalloped edged paper scissors to make shingles for the roof.Cuteness and quick. All of this holiday crafting makes me feel so far behind but this may be the year to forgo crafts. Wow! Small world! What a neat story. Rois... I want to see your houses! Thank you for the tip. Funny, I was just yesterday playing with scalloped edge scissors. Katie... it still tickles me. I hope everyone is enjoying a sweet Saturday morning!